So far, we are having an almost perfect English summer this year. 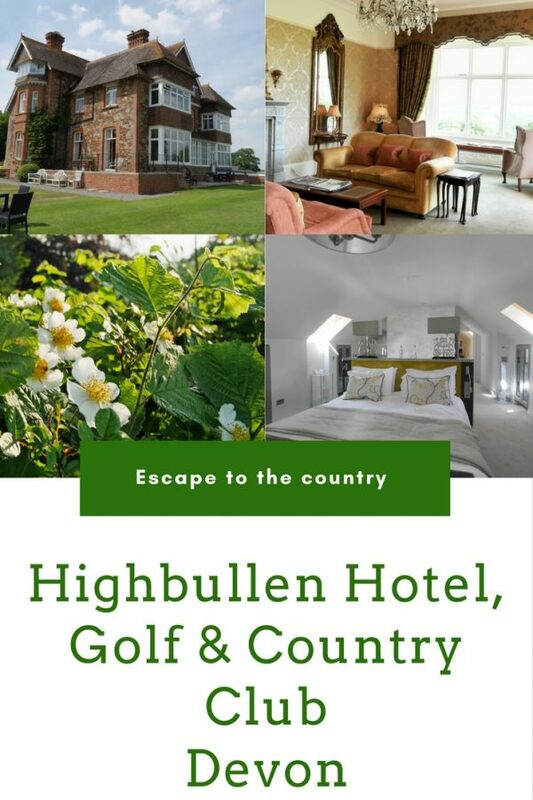 Of course, there have been a few days which are just a little too hot in the City, and on those days what better than to escape to the Country – somewhere like Highbullen Hotel. A couple of hours by train to Tiverton Parkway and then a journey across country to the hotel. 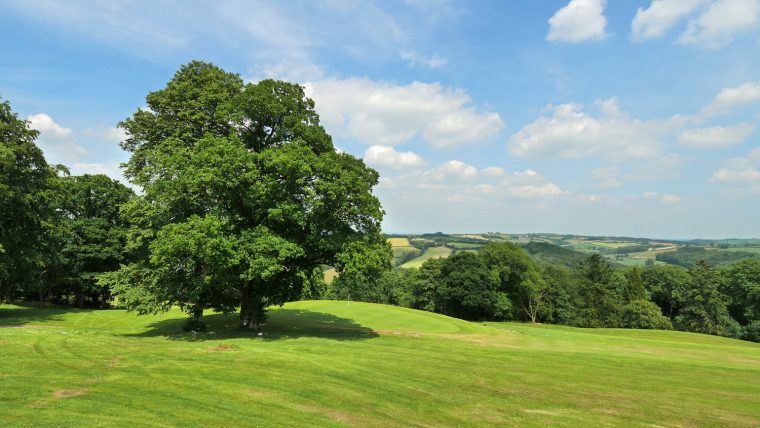 Or, an easy drive out from London through some of England’s prettiest countryside in Wiltshire, Dorset and Devon. Arriving at the stunning manor house it’s easy to forget everything left behind in the City. 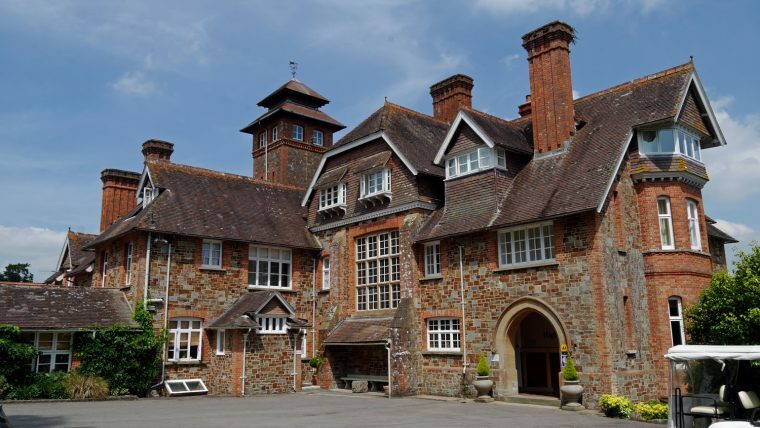 Built as a family home in 1879 by architect William Moore, it takes inspiration from the Arts and Crafts movement and Philip Webb. It remained the family home for 40 years or so. It was first converted into a hotel in the late 1950s and was remodelled and developed by the previous owners, Hugh and Pam Neil. 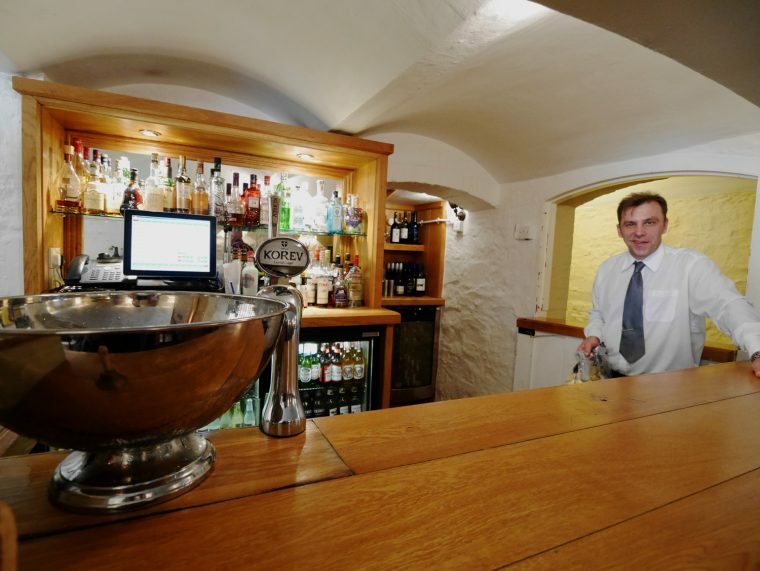 The current owner, Frank Chapman, was at one time a guest at the hotel and when the hotel was put up for sale in 2012, he bought it and started his own programme of extensive restoration and expansion. There has been an almost constant development programme ever since, with more to come. 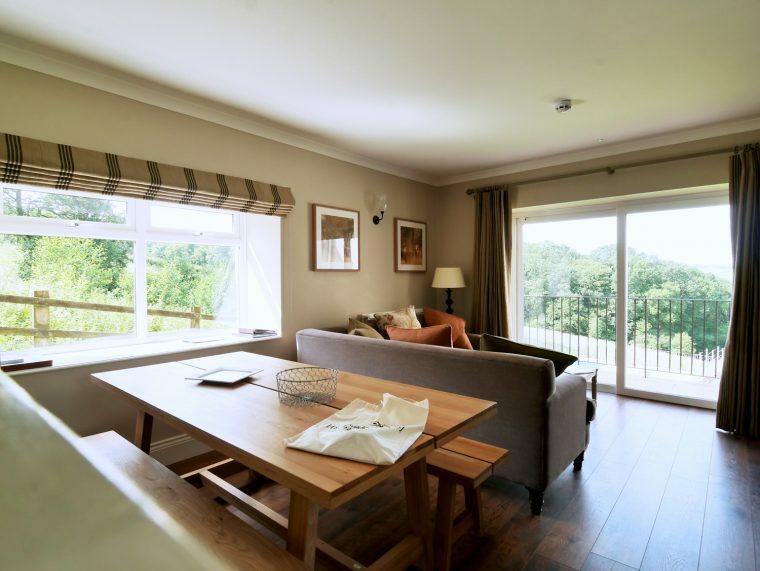 We checked the extensive conference facilities and some of the stunning self-catering cottages. There are tennis courts, an 18-hole golf course and a health and fitness centre with a large gym, indoor swimming pool, sauna, steam room and jacuzzi. 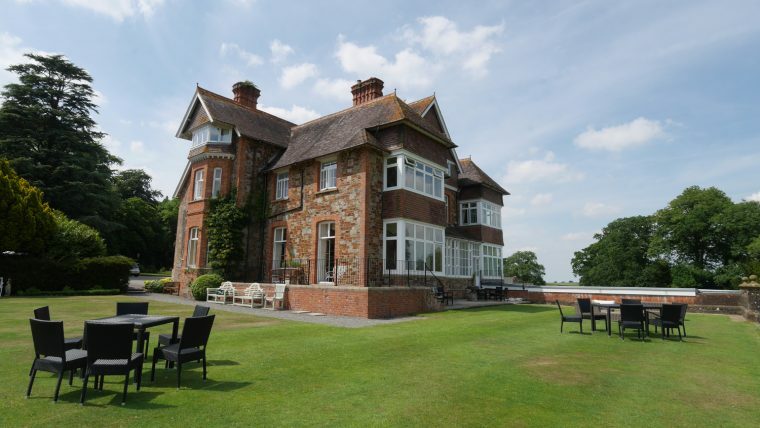 There’s also fishing on a private stretch of the River Mole, croquet on the lawn and a billiards room with a full sized snooker table and more. 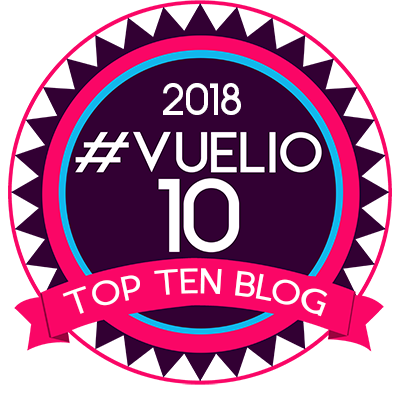 But, it is the main house which for me is the jewel in the crown with a wealth of Arts and Crafts features and with comfortable, traditional furnishings in most of the common parts. And, the countryside itself is a crown that is worthy of any king. We started our stay, as everyone should, with a Devonshire cream tea looking out over the rolling hills. Tea here is hearty and filling, with home made cakes, classic sandwiches and of course, scones, jam and clotted cream. Whatever you do make sure that you set yours up Devonshire style (with the cream on the bottom and the jam on top). Afterwards, you may just want to do as I did and go for a swim in the outdoor pool, or for a walk around the grounds before dinner. This is the kind of place where you could stay for a week or more and still find new things to try. I was genuinely sad not to have a chance to spend more time just exploring the grounds and the local countryside. 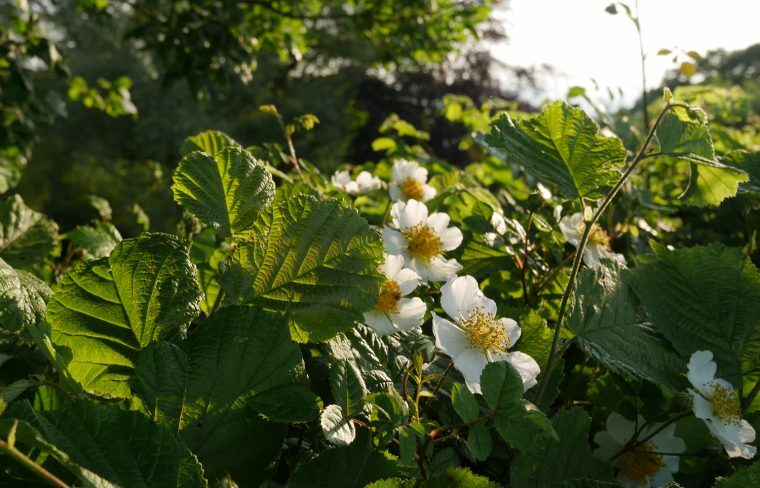 The hotel has a number of walks that you can take if you prefer a leisurely ramble to tennis or golf. And, when it comes to dinner, you won’t be disappointed. 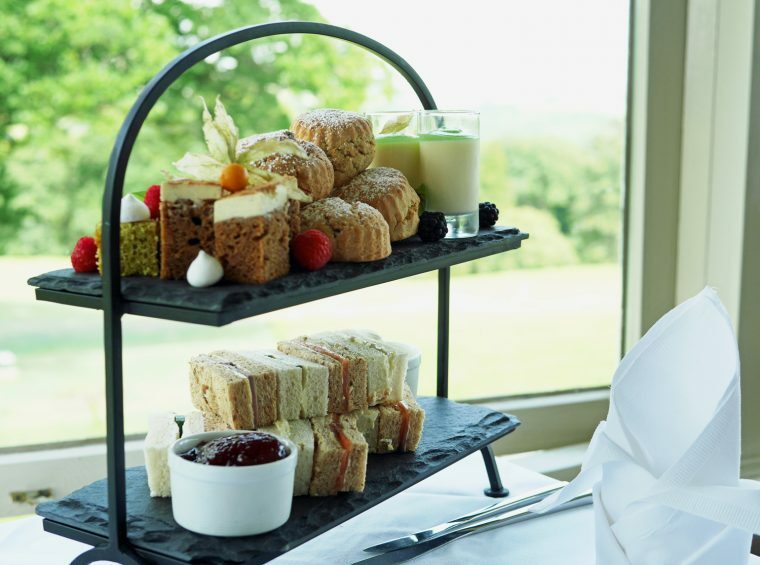 There are three dining options, the most informal at the Health and Fitness centre while the hotel itself houses the Cellars Bar, a bistro serving informal meals from burgers and pizza to steak and chips and the Two Rosette Devon View restaurant, which is also used for breakfasts and afternoon teas. We were lucky enough to dine in the private room that is part of Devon View. After a gazpacho cappuccino amuse bouche we enjoyed a delicious plate of Lyme Bay lobster served with heirloom tomatoes, Devon crab relish, coriander and balsamic. 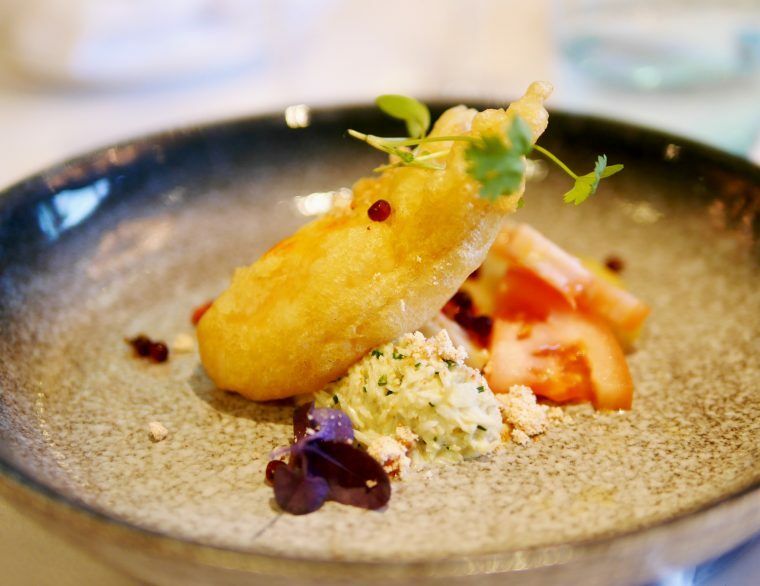 the lobster was served in a tempura batter, a lovely contrast to the sweet heirloom tomatoes and fragrant relish with coriander. 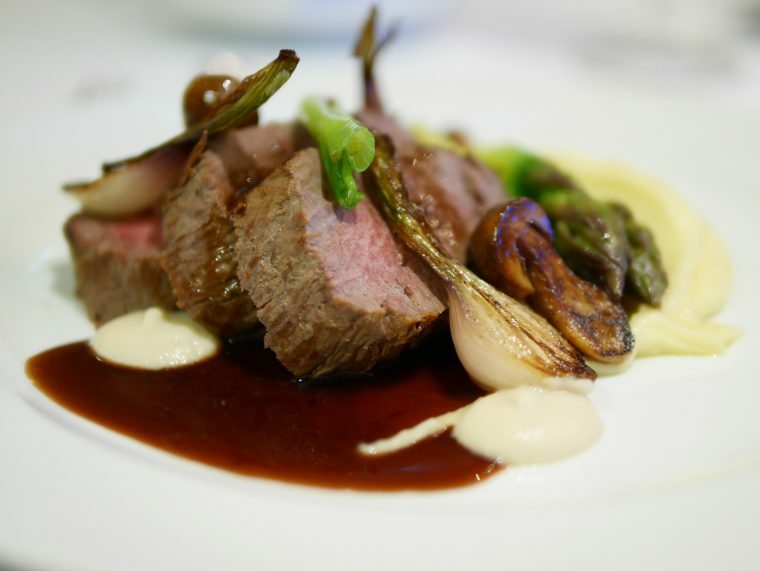 My favourite course, the roasted fillet of 28-day aged beef was a classic dish, served with smoked potato puree, English asparagus, cep jus and textures of onion. 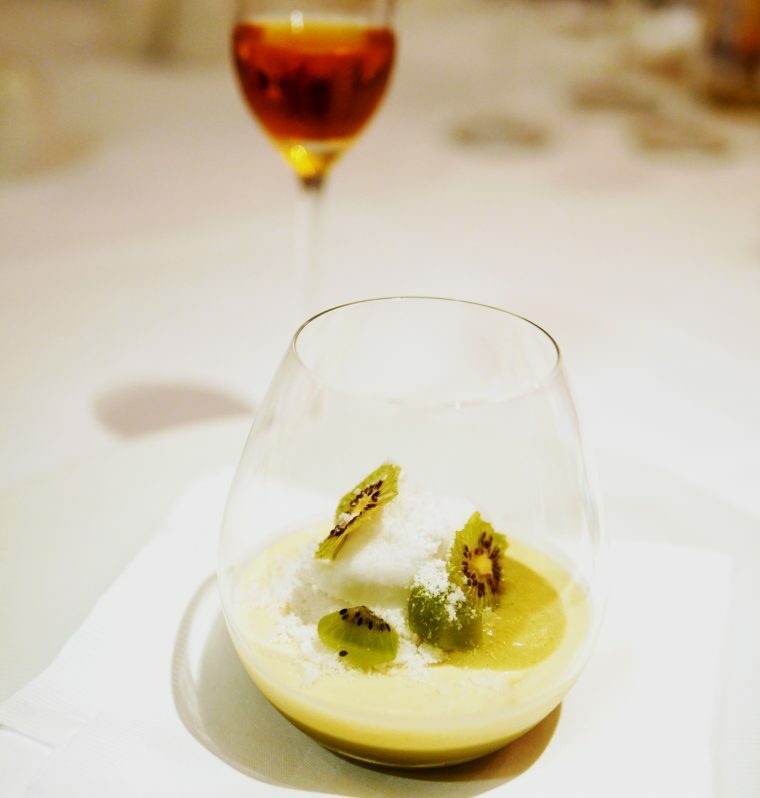 We finished the meal with lemongrass pannacotta served with kiwi fruit and coconut sorbet, a light and refreshing end to a dinner which was rather better than the 2 AA rosettes held currently by the restaurant. I woke early the next morning and went for a dawn walk around the grounds. If you are lucky enough to end up at Highbullen, I can strongly recommend doing just that, when the dew is glistening on the grass and the morning light bathes the countryside in a warm glow. After a swim in the indoor pool, a hearty full English (without the egg) was definitely deserved. The restaurant has such stunning views it’s hard not to just stay and watch the world go by. But, actually, there are plenty of places to escape and relax. A couple of comfortable lounges, pretty lawns and the cosy cellar rooms for example. Highbullen is somewhere with plenty of options. In terms of accommodation, you can stay in the largely traditional house, with stunning arts and crafts rooms like the Chinese Room. 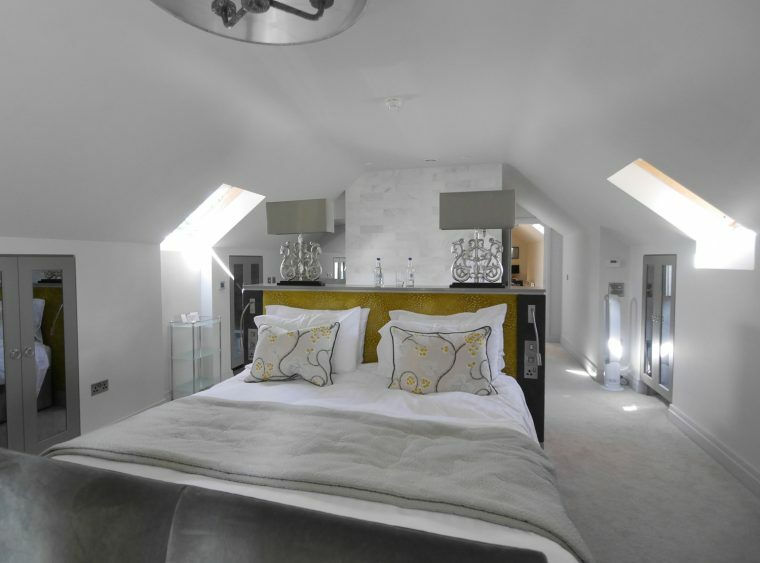 There’s a contemporary styled loft suite too, perfect for a wedding night with its own sauna, steam room and freestanding bath – and with views that are unmatchable. For a little more privacy you might choose to stay in one of the rooms away from the main hotel which are also more contemporary in style. If you prefer not to walk, there are a collection of golf buggies to ferry you backwards and forwards or you can simply call reception and ask for a lift. 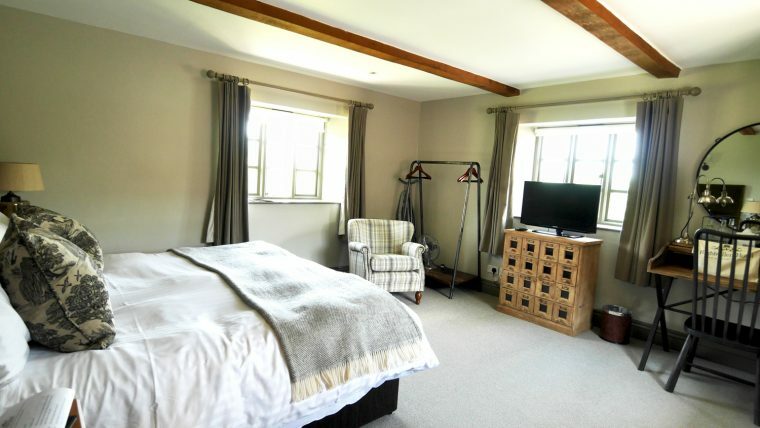 Or, for the ultimate escape, there are several high-quality self-catering cottages on offer, each fitted with a full kitchen offering guests the chance to dip in and out of hotel services as they want. 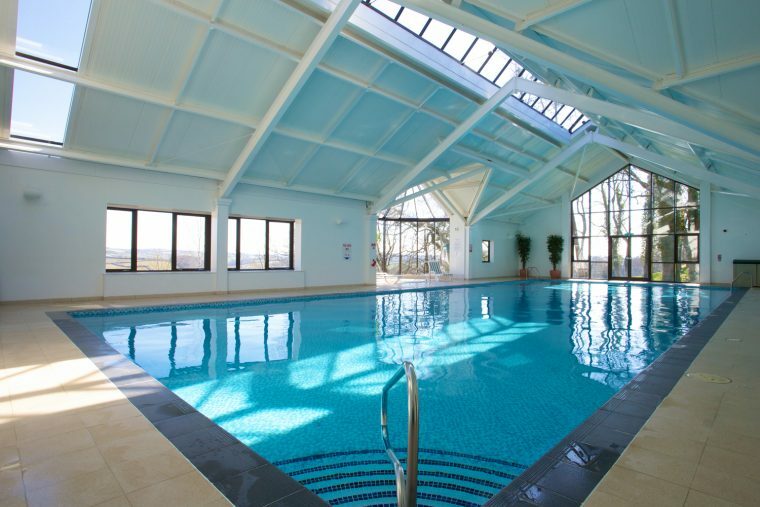 Perfect for small groups or families, you could easily spend a couple of weeks here in the summer, making use of the health club facilities and with excellent dining options on tap for when you don’t want to cook for yourself. This is the kind of place where people return every year. Once you’ve found your personal nirvana, it must be all too easy to do just that. A home from home – a place in the Country – and a perfect escape. 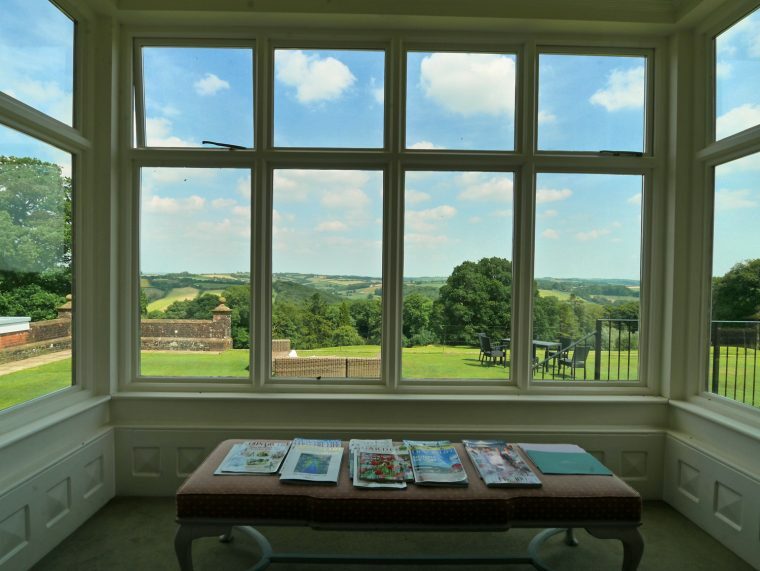 Highbullen combines an interesting history dating back to 1879 enhanced with contemporary touches and modern luxuries, set within a sprawling 127-acre estate with views across the Mole Valley and Exmoor. 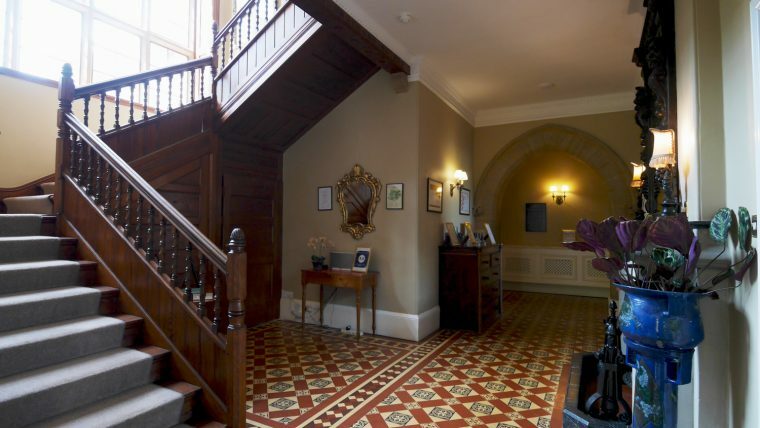 The Victorian Gothic Manor House is home to 12 beautiful bedrooms, including the spectacular Loft Suite complete with its own steam room and infrared sauna, whilst a further 30 bedrooms can be found throughout the Estate. Highbullen also offers four luxurious cottages. 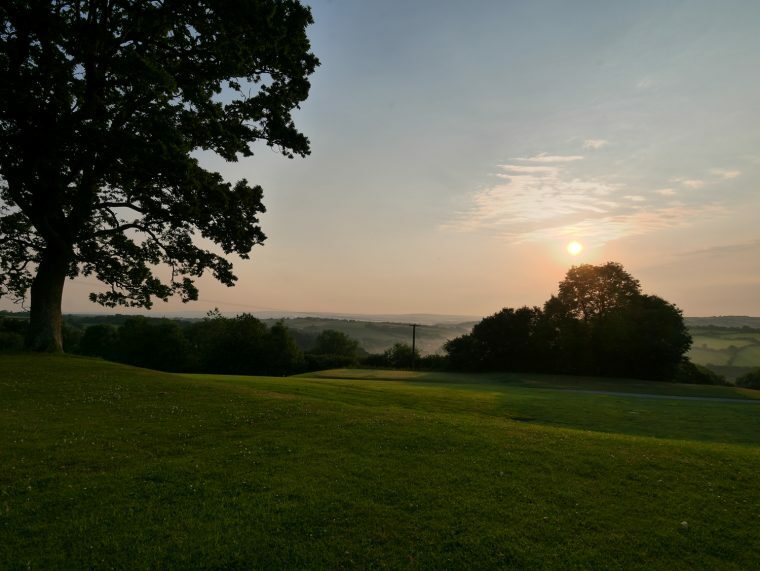 Facilities include an 18-hole USGA specification golf course, a multi-functional golf simulator, seven LTA standard tennis courts with access to professional coaching and a pavilion, an outdoor and 20-metre indoor swimming pool with sauna, steam-room and jacuzzi, as well as providing a perfect base for some of the best hunting, shooting and fishing in the country. 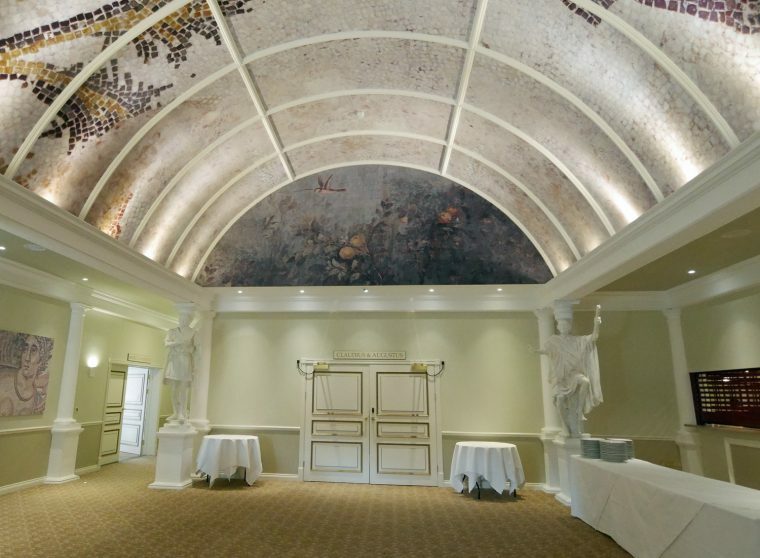 Highbullen’s Italian styled Palazzo is a flexible venue with six diverse spaces to host up to 400 guests, whilst the hotel’s vast grounds provide a beautiful backdrop for marquees and dancing under the stars. In the summer months, the large outdoor terrace or the croquet lawn next to the Manor House are perfect for ceremonies and receptions. *Prices start from £119 per room per night on a bed and breakfast basis or from £650 for a week’s stay in a self-catering cottage. Seems like a great hotel to stay at! 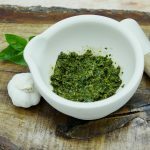 Excellent post, Fiona! Is the spring the best season to stay there? This hotel is very impressive. The design and architecture from the outside is so classic. While inside have a modern touch. The view is so beautiful. I would love to stay here someday. Devon was the first placed I lived when I first moved to the U.K. in 2002. Such a beautiful part of England. 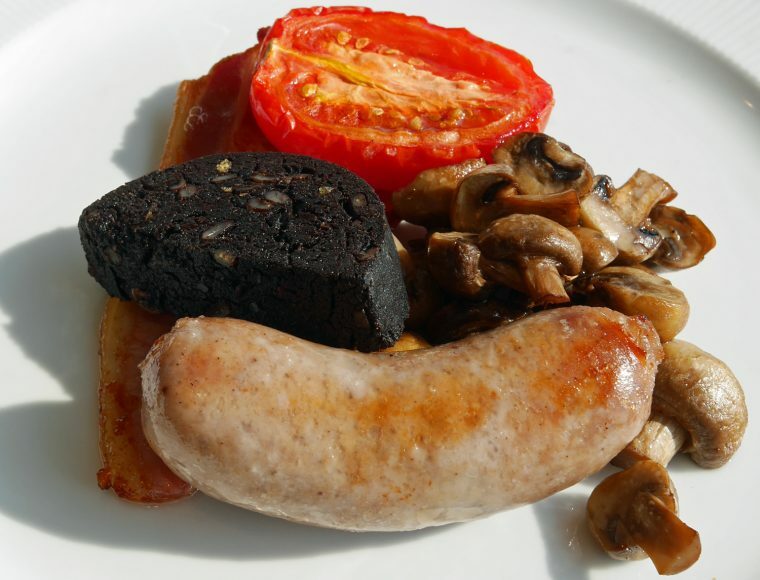 Highbullen Hotel looks the bomb and just the right place to enjoy a little slice of country England. What a beautiful house & grounds & I’m licking my lips are the sandwiches & cake! 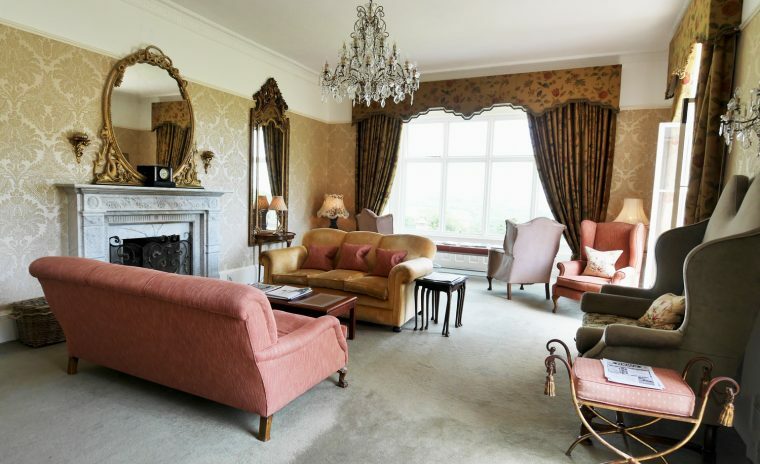 Wow what a stunning historic manor house – I love that they maintain the integrity of the original building while combining with contemporary facilities – this is my dream UK trip, escaping to the country to a luxury retreat where I can feel like a Queen! 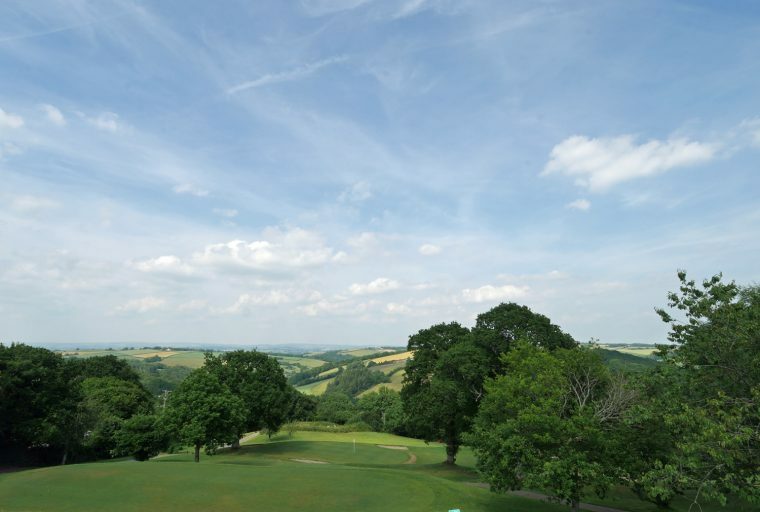 Thankyou for the recommendation on Highbullen Hotel, Golf and Country Club – I can see how it would be very easy to spend a full week 🙂 Personally I really enjoy the tranquility of walking around such beautiful grounds. Wow! 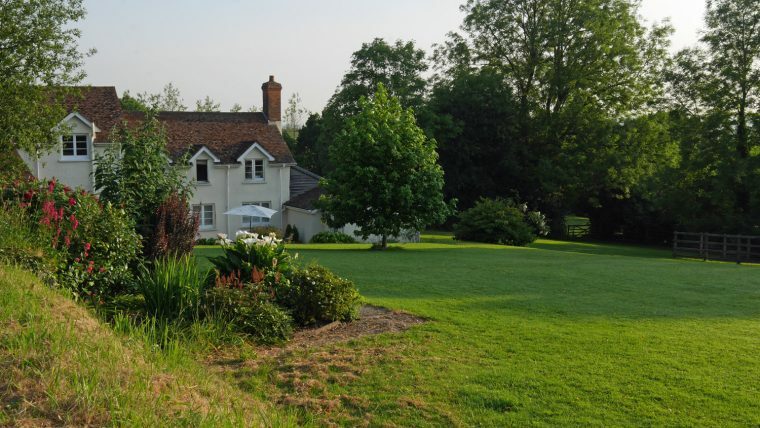 That does look the perfect English getaway! The food looks super yummy! Lemongrass panacotta. I imagine that tastes as delicious as it looks. 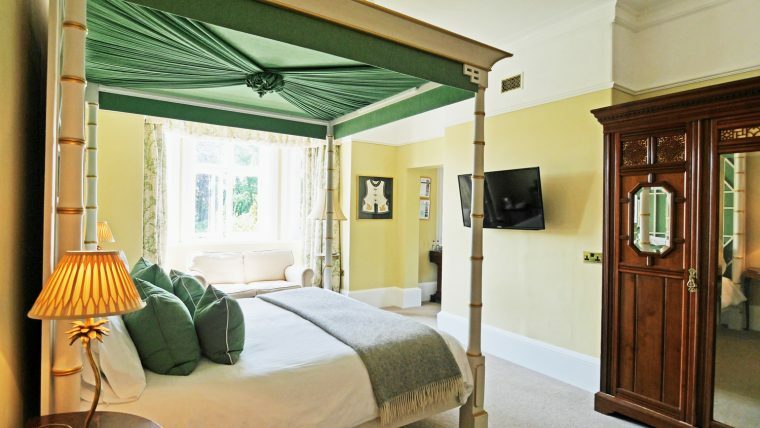 Love the four poster bed in the suite. Would love to stay here! Thanks for sharing.